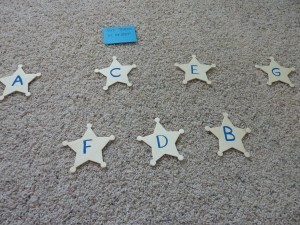 These wooden alphabet stars were one of the first My Obstacle Course station materials that I came up. 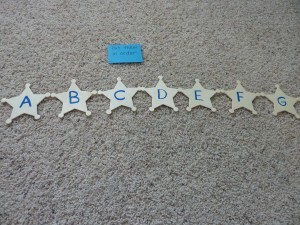 I purchased some blank, wooden star-shaped pieces from Michael’s and wrote the letters A-Z with permanent marker on each piece. That’s it! I still have them and they are in great shape! When I made these, Andrew was 4 and was not saying any consonants and so we didn’t know if he knew his letters. He must have been so frustrated with us because he would say the letter but since we didn’t understand him, it was hard to know if he was understanding the difference between them. Turned out he was and I will one day thank him for his patience with me!! He wasn’t crazy about sitting and pointing to things (so many other more interesting things to do!) so I decided to work on letter recognition in a ways that would get him moving. 1. Hopping Through the ABC’s! I set out the stars in alphabetical order but had them winding around on the floor. The purpose of the station was for him to hop from letter in order from A to Z. I said the letters out loud as he jumped to them. 2. Stand On the __! I set out the stars in a random way. When he got to the station, I would call out a letter and he would have to go and stand on it. I would do this about 10 times before moving on to the next station. He really liked things like this and so I wanted to keep it something that he’d want to do again, perhaps in different ways, but still keep it fun and not beat it into the ground, if you know what I mean! 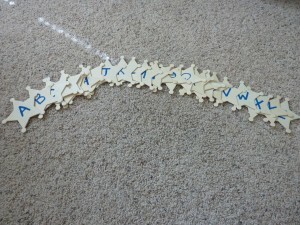 This is a great activity to work on letter sequencing and abc order. It can be done with any letter sequences and can even be accompanied with a sheet showing the letters in order as a reference. Remember, if they need it, let them use it! Learning to refer to something and check one’s work is also an important skill to learn. I refer to lots of things even as I write these posts to try my best to spell things correctly. Provide letters needed to make a word, like their name or something that goes with a theme. Show them the word, tell it to them or give them a clue, whatever they are ready for, and have them put the letters in the correct order to make that word. This could be combined with crawling from one end of a room to the other to add some physical movement (kind of like the Crawl and Match activities I have posted on before). Something so basic yet allowed me to engage with him in a fun way, showed me what he knew and helped me to provide ways to build the literacy skills he was ready for.